If you watch cable news and listen to many politicians, you would think that we live in an extremely divided country. And maybe we do. However, maybe I'm an optimist and believe that we have more in common than things that divide us. People just want to be healthy and safe, want the best for our kids, and except for some folks in the northeastern part of the country, root against the New England Patriots. Something else that bonds most Americans is our love of snacks. And that’s where we need to come together as Democrats, Republicans, Independents, Libertarians, Green Party members, unaffiliated voters, Librarians, Mechanics, Cosmetologists, and everyone else to support an important cause. I am a big fan of your products and eat Rold Gold pretzels probably more often than I should. At a local grocery store recently, I saw that Fritos were on sale, so I wanted to buy the BBQ flavor. While there were a half dozen different varieties of Fritos, the store didn’t carry BBQ. At a different grocery store, I also noticed that they no longer carry this flavor. Additionally, I see that this flavor is not listed on your website. Do you no longer make BBQ Fritos? If this is not the case, where can I find them? Thanks so much for writing to us about Fritos BBQ. This variety has been a fan favorite for years, and we’re very sad to say it has been discontinued. We know that’s a big disappointment since fans like you have been looking high and low for it! We’re sharing with our Fritos Team all the feedback we receive from our loyal, passionate fans as they may consider bringing it back in the future. Thanks again for reaching out to us! I’m sending a coupon to you and hope one of our other snacks will satisfy your taste buds! Sean's note: If BBQ Fritos have been a fan favorite, why discontinue it? Tina, Thank you for your quick response. Just out of curiosity, what was the reason behind discontinuing the Fritos BBQ? Is there data available to show that this variety had poor sales in relation to other Frito Lay products? 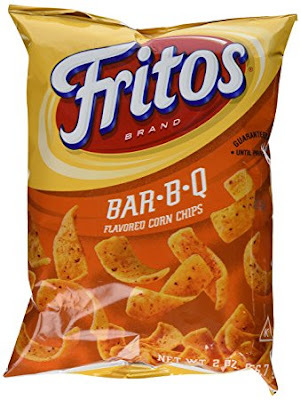 More importantly, how can I start a campaign to get Fritos BBQ back? Do you need a certain amount of tweets or signatures on a petition? Thank you for writing again. I appreciate the turn around. All we know, is what's been shared before. We are sharing feedback as we are receiving contact detail. Who's to say what the future will bring? The executives know how loyal consumers feel, we are ourselves Frito-Lay fans. I cannot encourage anyone to spend time on a campaign for the return of a specific snack. Thanks again for reaching out to us! We value your loyalty and truly appreciate your business. I was prepared to start an online campaign, but it looks like two people already introduced petitions. Please sign these petitions and contact the Frito-Lay company to let them know that you want, no DEMAND, the return of BBQ Fritos. Might as while call your Senator and member of Congress on this too. They probably don’t have much going on! And this is something both sides can agree on to help the country. Let's do this. U-S-A! U-S-A! U-S-A! This is a travesty of justice of biblical proportions! Thank you for bringing this to my attention Finally, a cause I can get fully behind!! Richard - This really should be a bigger story than it is. If Americans can't unite around this, our country is doomed! Agreed. The greatest of all snacks that would loosely fall under the "chip" category is gone and I wasn't even aware until I read your post! My heart shatters into a million pieces every time I notice they don't have my BBQ Frito's. The day is basically ruined after that for me. (Just take me home, w a face of utter defeat, smh!) I have gone to nearly every gas station, Grocery Store, Mom & Pop shops, hole in the wall places, Sketchy places, 3 different States (DMV), EVERYWHERE and they don't have them! I hate the twist ones. Its like i have to search the dark web just to secretly get my hands on just one bag. Like I have to meet someone in an alley next to the dumpster in an abandoned part of town to have this delicacy! I literally have people on the look out for those scrumptious jewels just in case its that last bag. ( I have to stay hopeful right?!) But, no luck. I just suffer day and night, week by week, BBQ Fritoless, snackless, drowning in my tears, in the dark, Alone., with the windows covered in black Tarps. Severly Depressed. Now I suffer from Bbq Fritoless Syndrome. It causes intense mood swings, Chronic sadness, Chip aisle phobia, Sleepless days and nights, Vending Machine Vengefulness and Chronic BBQF cravings. This sickness is severe and there is only one cure. * A bag of BBQF. I don't wish this on my worst enemy. I don't know how I've made it this long or how much longer I can survive. I do believe I need to check my self into that rehab facility BBQF-LESS Manor & BBQF-LESS ANONYMOUS classes need to follow. The CEO of this company needs to go. How stupid can he/she be as to stop producing what even they call a fan favorite for over 80 years? Bring back the BBQ Fritos chips today or we will not purchase any of your other chips until you do.